More than just a seal, more than just a lock: the Sealock Model SL is both, and then some. By aﬃxing to the container’s keeper bars, the Sealock Model SL acts as a barrier, preventing the doors from swinging open. And by securing the lock through the traditional right-hand door sealing aperture, the Sealock Model SL acts as the container’s seal. Most importantly, because it is a complete sealing and locking system, removing the Sealock means that the all-important seal must also be removed. The payoﬀ: your cargo container’s integrity is secured reliably. Made of environmentally friendly recycled steel or heat-treated carbon-chromium alloy spring steel, the Sealock bar Models SL and SL-X require 2 cuts and 2 tools for removal (including power tools), thereby preventing opportunistic, smash-and-grab break-ins. And the lower-strength, cost-eﬀective Sealock cable Model SL-C provides the same tamper- evidence and also requires 2 cuts to remove. Moreover, any attempts to defeat any Sealock in a covert manner will be immediately identified because of the Sealock’s built-in tamper- evident characteristics. How Would A Major Loss Affect Your Company? In 1996, a company in Paraguay discovered cargo missing from their container. The insurance company denied their claim because the container had arrived with the seal intact. A consultant from Sealock Security Systems, Inc. examined photos of the container before opening, during unloading, etc. He noticed that the one bolt head that matters – the one that aﬃxes the sealed handle to the innermost right-hand keeper bar – was rusted, whereas all the others were not. These photos, which showed clear evidence of tampering, were sent to the insurance company. The insurance company paid the $48,000 claim without putting up even the slightest argument! Locking bars and barrier devices provide only a false sense of security. Once removed, their absence is likely to go unnoticed because the container’s primary seal would still be intact and aﬃxed. Moreover, because they only lock the container doors together and do not attach to the container seal aperture in a traditional sealing function, they are vulnerable to other tampering attempts and container vulnerabilities. Ultimately, a conventional seal, no matter how strong or intelligent, only ensures that the door handle has not moved away from the door. It does NOTHING to keep the doors from being opened and closed again. The Sealock Model SL and SL-X have steel bars and brackets covered with a smooth, tamper-indicative baked-on enamel finish. Sealocks are the only locking bars that use the powder coating process to prevent rust and provide tamper evidence. An insider who might try to cut the bar and weld it back together to hide the evidence would face a diﬃcult if not impossible challenge. Moreover, the all-cable Sealock Model SL-C employs corrosion- resistant galvanized steel braided aircraft cable that frays when cut, making covert re- welding impossible. And ALL Sealock models use a cable seal component to simultaneously seal the container and lock the security bar, a feature exclusive to Sealock and patent protected under U.S. Patent 6,331,022. Only Sealock provides a total cargo security solution. 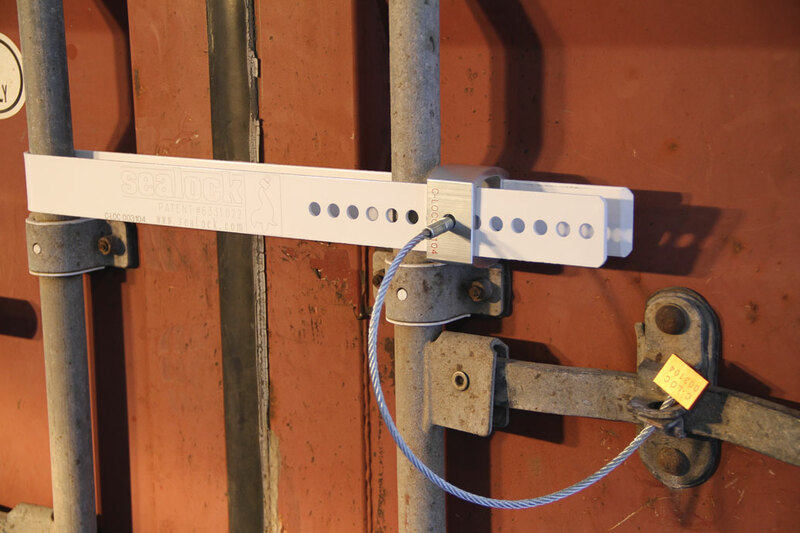 Sealock locks AND seals both container doors simultaneously with one device. If the lock is broken, the seal is removed, and the break-in is easily detected—thereby ensuring the integrity of your supply chain. Sealock: We didn’t just set the bar. We are the bar.